When the digital tools becomes a natural part of your day! When you digitalize your workplace, it creates several opportunities for collaboration, communication and efficiency within and outside your organization. Do your users really use all of the opportunities? Our Digital Coaches facilitates to work for your users to see the possibilities that your digital tools have to offer. There are several digital tools today and if they are used correctly they offer great opportunities for your users to become more efficient in their daily work. To gain effect of your investment in your digital tools can be a challenge that many organizations faces. At the start of the journey Infozone’s Digital Coaches defines what support your organization might need to gain maximal effect and usage of your made investment or investment to come. We customize a solution for your organization so that it suites your users and your organization. Our Digital Coaches works with solutions for both software and hardware. We are experts at coaching your co-workers to gain optimal usage within programs such as Office 365, SharePoint, Webex board, Citrix Workplace, Microsoft Surface etc. 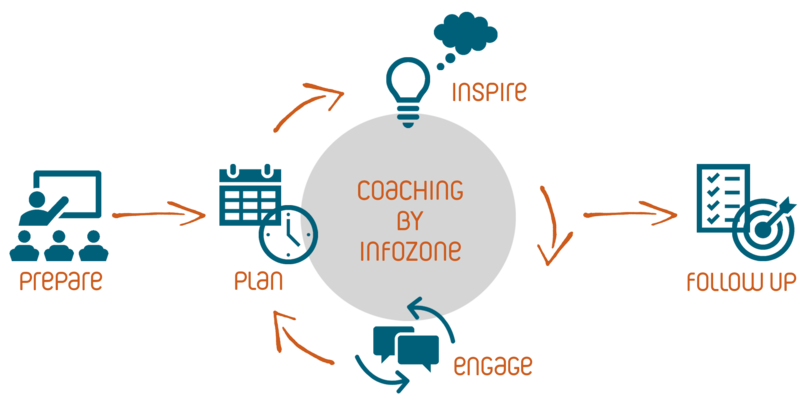 Infozone’s Digital Coaches base their work in the method that we feel is the best for implementing new tools. Prepare – We start by finding our more information about your organization. How do you work today? What tools do you have and how do you use them? Together we set your efficiency goals to know what direction we should aim at and what we can measure and follow up. Being able to follow-up the work in the correct manner we also need to identify what measurement methods is important for you and how often you want them to measure. Plan – Based on what’s emerged from the preparation, we plan on how the work will proceed. We Create a communication plan for the introduction where we identify the audience that is relevant, what to communicate and when they should receive the information. Inspire & Engage – Inspiration and engagement can be created it many different ways. Our digital coaches work for example with inspiration seminars, educations physical or over for example Skype, ambassador programs etc. this is decided through what is best suited for your organization. We also have partnership with other companies that offers online learning. Follow Up – Throughout the project we have continuous follow up to set the efficiency goals that we identified during the preparation step. After the project we deliver a report to you where we describe what we have done, what we have achieved and what we recommend your next step to be on your digital journey. Would you like to know more in regard to Digital Transformation, Digital Workplace or our Digital Coaches, contact Katarina Gullstrand, Team Leader Digital Coaches at Infozone.